The Physical Review Letters study is titled "High-accuracy mass, spin, and recoil predictions of generic black-hole merger remnants." I don't understand how we can see black holes merging. Light from the point at which their event horizons connect will take an infinite amount of time to reach an external observer so they will only see what was there before ie space outside either event horizon. Similarly how can we see an object falling into a BH ie crossing its event horizon. As it gets closer to the event horizon the light takes longer to reach an external observer till at the point it crosses it takes an infinite time so only what was there before, ie the gap between the object and the event horizon, is ever visible. Any answers? 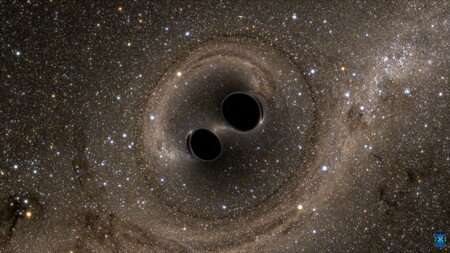 I don't understand how we can see black holes merging. Replace "see" with "detect". In xray or radio astronomy we also don't 'see' anything. In this case LIGO is looking for time-dependent changes in spacetime curvature (as gravity has no problem escaping a black hole). Event horizons are also not some material thing, but just a mathematical threshold. What we can measure is the curvature of spacetime around black holes (by looking at stars behind them and also the gravitational effect of the black hole on nearby objects). The definition is sometimes a bit iffy, but a BH is the collapsed mass that is strong enough to form an event horizon. So technically the event horizon isn't the black hole even though the two notions are often used interchangeably. I studied physics and came top of my class in GR, not that we studied anything so esoteric as Black Holes (in the 1990s). Gravitational waves can't provide any more information that EM waves. I get that in the Space-time metric a BH can coalesce but can that information be transmitted to an external observer? jd, v_p & a_p are all correct in how scientists "observe" all the fun puns of singular events at extreme astrophysics. As a non-scientist? My answer to your question "How do we see BH, etc?" Aside from gravitational waves, what is being observed is all the crap being dragged around by the high-gravity wells. All that crap crashing together, smushed into spectacular spectrum of radiation & the debris expelled from the wreckage. That in turn, is the cause for the pretty petty, weakass EM insignificant sparklees that appeal to our monkey brains.